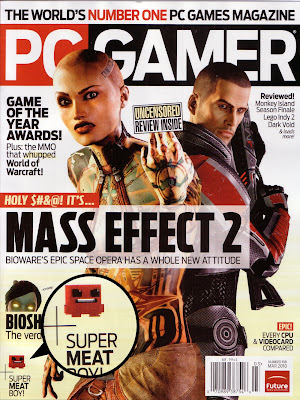 Edmund's dev blog for gay nerds: Meaty Pc Gamer cover!? So ive obviously been slacking when it comes to updating the blog.. i think we will have something automated from our twitter soon enough as well as a whole site revamp in the coming weeks, but for now ill play a little catch up and post a months worth of notable twitter updates. http://elder-geek.com/ - Very fun podcast we did with them the other day is up, also a neato cover image as well! check it out. http://twitpic.com/zobmg - Near final cover image for SMB issue #2 coming out at GDC! http://twitpic.com/zobtw - Also Here's the process of creation for that cover for those interested. http://bit.ly/dz8TD - 6 new SMB screen shots showing ch2, new retro levels and mechanics like fans and keys! -SMB will easily have over 10 hours of gameplay for the expert gamer and WAYYYY beyond that for the average one. 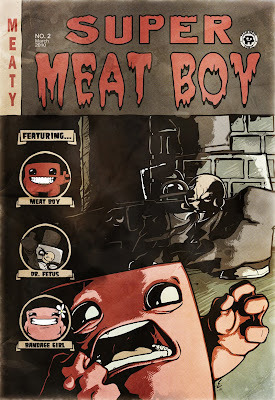 -Flywrench will be a playable character in Super Meat Boy! -Due to the addition of 150 more levels and other extras SMB will be pushed back from the Q1 release date but not by a ton. This month is going to be crazy, we will have ch3 finished and playable for GDC, the second Meat Boy comic printed out (its 20 pages!) new video footage will be posted showing the games 2nd chapter and boss in action as well as a very big announcement that should make a lot of you guys VERY happy. its been a crazy month to start a hopefully equally crazy year! oh and we are still giving away free comics every Friday on twitter, so follow us!.